Today's recipe I opted to prepare at the time when there was no baking oven at my place. I came across this microwave recipe on a social networking site [obviously it has to be FB,,,a piece of cake if you guessed it rightly ;)] by a member Ekta Chopra. Her recipe was followed by many other members who did some changes to the original recipe. A yummy and an easy to make cake. We can bake this cake in microwave, oven and even in pressure cooker. All the ingredients are easily available, an eggless recipe and the microwave option. I had to try this recipe. Empty the packets in mixer and dry grind them to fine powder. Add 2 tsp of sugar, half a cup of milk and stir again in mixer to form a smooth batter. Add 3/4 tsp of ENO [fruit salt] and stir everything in mixer. Grease the microwave vessel with butter and pour the mixture from mixer into this vessel. Once the cake is done allow it to cool. 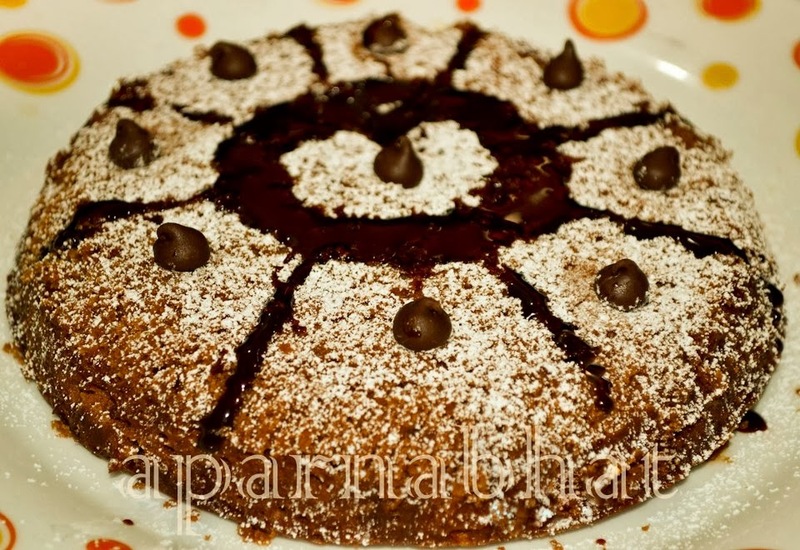 Now transfer the cake to a plate and decorate by sprinkling some icing sugar, choco chips and chocolate sauce. Slice and serve. This looks too cool! with all readily available ingredients, and no chemicals (ya, except for the ones they added in the biscuts :)) I have to try this one. I hope to get my lazy bones moving and try this out soon :) Thanks!! (contd from my previous comment)...and more importantly, no oven! @sundeep kd: thnks for the try and your feedback...since this is eggless and in regular microwave mode the cake wont rise so much. Secondly I have mentioned to use non flavored eno in the recipe above. if i dont have eno what should i do? It is sticking from bottom..i dont know y? Tried it a while ago! fantastic recipe :) tastes great and so instantly done :) pls share if there are more variants to this recipe. So you mean that we have to find the perfect setting as per our microwave? ? ?